Security on duty outside Saudi Arabia’s consulate in Istanbul in October 2018. Jamal Khashoggi, a Saudi journalist-in-exile, frequent critic of the ruling House of Saud, and Washington Post columnist, went missing after entering the Saudi consulate in Istanbul on Oct. 2. Since then, Turkish government officials largely speaking under the cover of anonymity have insisted that Saudi security forces waiting in ambush inside tortured and murdered him in revenge for speaking freely about their autocratic rulers. The moments of his “interrogation, torture and killing were audio recorded and sent to both his phone and to iCloud,” the pro-government, privately owned newspaper paper reported. The Turkish newspaper said conversations of the men involved in the reported assassination were recorded. 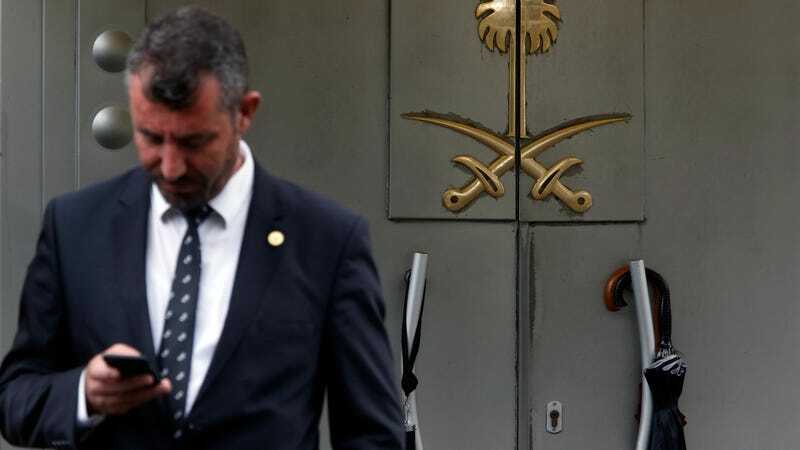 Security forces leading the investigation found the audio file inside the phone Khashoggi left with his fiancé, according to Sabah. Upon noticing the watch, Sabah reports, Khashoggi’s assailants tried to unlock the Apple Watch with multiple password attempts, ultimately using Khashoggi’s fingerprint to unlock the smart watch. They were successful in deleting only some of the files, Sabah reported. The discrepancy between the report and reality, however, is that the Apple Watch does not contain its own Touch ID sensor. It cannot be unlocked using a dead person’s finger, as it is possible to do with an iPhone, without access to a paired device. Days ago, Reuters also reported that while Apple Watches can transmit data like GPS locations and heart rate, it’s unclear what kind of model Khashoggi owned. Only the high-end models have LTE connectivity, meaning that he would have otherwise had to be connected to the phone via BlueTooth, which has limited range. Reports have indicated Khashoggi only had realized how much danger he was in relatively recently, though he appeared to have been wary of entering the embassy alone. CNN intelligence analyst Robert Baer told host Anderson Cooper that he doubted the watch in question would have been in Bluetooth range of the phone and that Khashoggi would have needed to plan a recording in advance. He suggested that Turkish officials may indeed have a recording, but are lying about how they obtained it to avoid acknowledging they have compromised the consulate’s security. Saudi officials have remained adamant that Khashoggi left the embassy a free man and only went missing afterwards. However, the journalist wrote numerous columns critical of Crown Prince Mohammed bin Salman, who is the designated heir to King Salman and de facto head of the country’s day-to-day government (including its military and security forces). The prince has long sought to portray himself as a Silicon Valley-style disruptor eager to diversify Saudi Arabia’s mostly oil-dependent economy into a regional tech and logistics hub, and he’s spearheaded billions of dollars of sovereign wealth fund investments into foreign tech giants like Uber and Softbank. At the same time, bin Salman has been trying to woo interest from major firms like Amazon, Tesla, and Lockheed Martin, with a particular focus on sectors like next-gen energy production and storage, chemicals, plastics, data centers, and high-tech military gear. In part to lure these investors, the kingdom has played up reforms like the end of a ban on women drivers (even as it conducted an absolutely horrific military intervention in Yemen and launched an ever-intensifying campaign to root out dissent). On Saturday morning, Trump promised in a 60 Minutes interview a “severe punishment” if proof emerged the Saudis are behind Khashoggi’s disappearance, adding that such an attack would be “something really terrible and disgusting.” However, he was reluctant to say it could impact arms transfers. The New York Times reported on Friday that Turkish officials hope they can swing his administration into applying some kind of pressure on the Saudi government, though they are skeptical Trump will put forth anything more than a token effort. Correction: A previous version of this article misstated Khashoggi’s relationship to his fiancé, Hatice Cengiz. We regret the error.